Esparza: If it’s not on the street, it can’t be street food. Gardiner: If it’s street food at heart, it’s street food anywhere. It’s a debate that comes into sharper focus with the opening of the Foodgarden Market at the east end of the Plaza Rio shopping center (Boulevard Rodolfo Sanchez Taboada in Tijuana’s Zona Rio district). Foodgarden is a shopping-plaza food court with the heart of a Singapore hawker center. It includes offerings from celebrity chefs: Javier Plascencia’s Erizo Baja Fish House & Market and Mexican TV chef Martín San Román’s La Rotisserie San Román; and up-and-comers like La Justina chef Iker Castillo’s Meraki Cocina de Humo and promising (relative) outsider Don Zefe Cocina de Hogar. 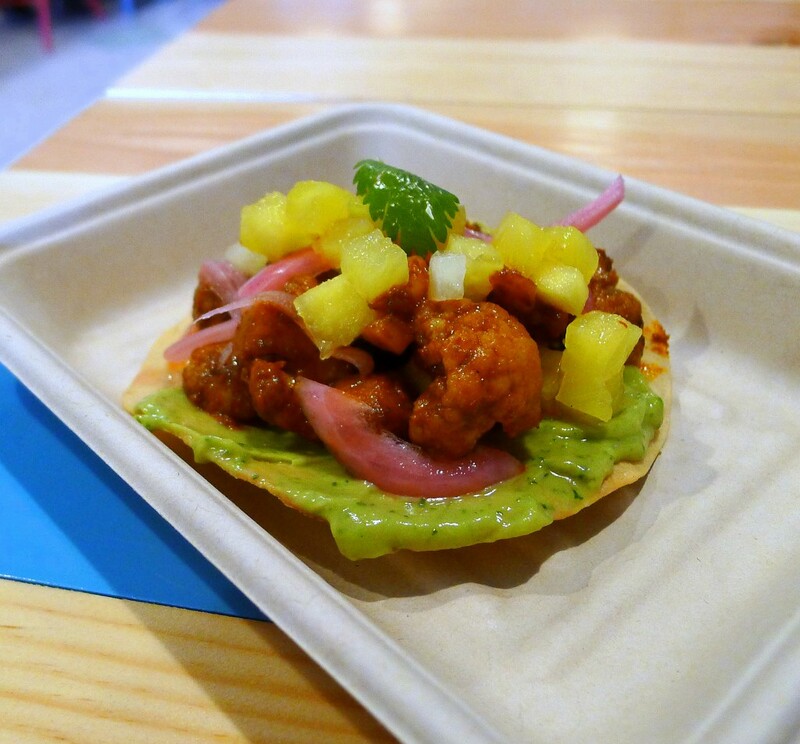 Perhaps the Foodgarden dish that best captured the spirit of the place was the tostada de coliflor adobada (tostada of roast marinated cauliflower) at Meraki. A vegetarian dish with the satisfying textures and savory flavors of meat, it has a smoky, barbecue-like indulgence. The crowning touch was bits of cubed pineapple, an apparent reference to Northern Mexico’s version of tacos al pastor known as tacos adobado. It is an exuberantly creative dish. Meraki’s octopus tacos were nearly as good, but Erizo’s take—”de la jefe” tostada—was even better. Featuring bits of tender octopus, a chipotle mayonnaise, tomato, avocado and pickled ancho chiles, it’s the theme of Baja-style mariscos (seafood) taken to its natural extreme. Erizo’s verde de camaron—ironically enough, with an endorsement from Esparza on the posted menu (“green, mean machine”)—is a shrimp ceviche featuring a serrano, habañero and tomatillo salsa, avocado and red onion pickle. It’s at the other end of Baja mariscos: simple stuff, perfectly done. Foodgarden also offers the French-based offerings of Martín San Román’s Rotisserie. The roasted leg of lamb is your best bet. And there is Don Zefe, to which chef Jose Rodrigo Figueroa has brought the “home cooking” from his La Carmelita food truck. Home cooking, that is, if your mom roasts pork belly to the point of a perfectly crisp skin and tender meat, serving it over lentils simmered soft but still retaining their shape. And there are so many other things at Foodgarden. There are more restaurant options: other Mexican, Italian and Lebanese food options, for example. And there’s the Ciadely Heladospaleta (Mexican popsicles) stand, La Cava del Queso cheese shop, a fresh vegetable shop, beverage options (adult and otherwise) and more. In what came close to a point of agreement, Esparza said that gastro parks like Foodgarden are a “yuppie/hipster’s idea of street food.” He’s not all wrong. But what Foodgarden really is, ultimately, is a place where culinary worlds meet with the opportunity to exchange ideas and energy, and you get to taste them whether they’re street food or not.